Remember last week when I gave you the details? Well....get ready for some awesome inspiration for your own door mat, and if you haven't signed up yet it is not too late! Sign up Now! 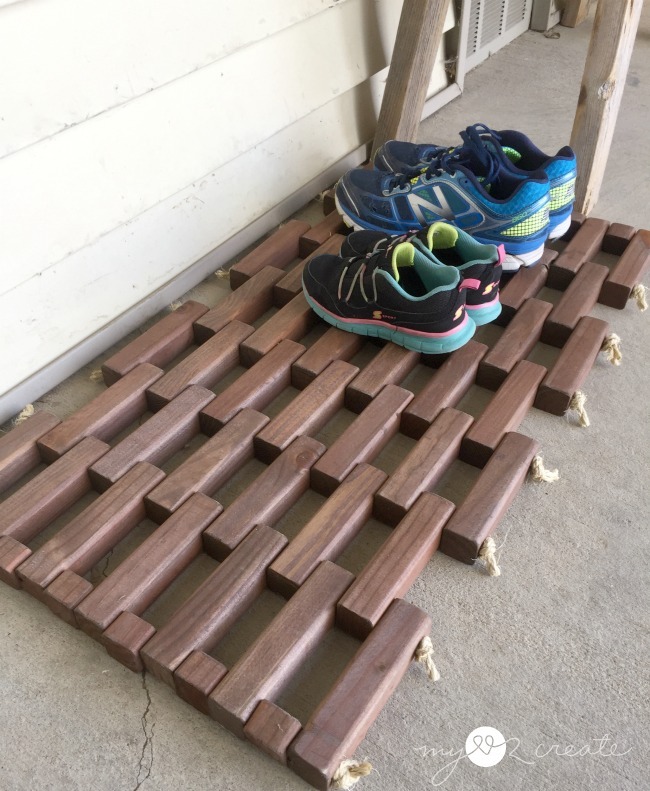 I have always loved the staggered wood look on door mats so I thought this would be the perfect time to try it, and it was really easy! 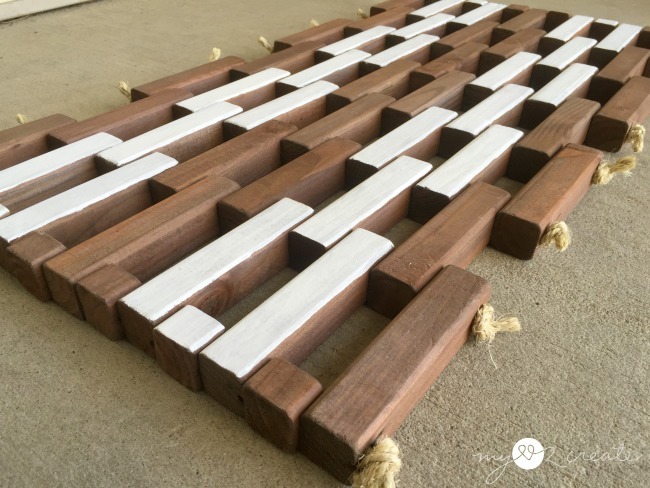 12- 2x2's or balusters cut at 3/4'', 1'', or even 1 1/2'' *please read the post and note the modifications that are optional, I made mine with 8 balusters and cut my small pieces at 3/4''. The plans read to cut at 1'', getting the cuts to fit into 8 balusters they ended more to the 3/4'' size. 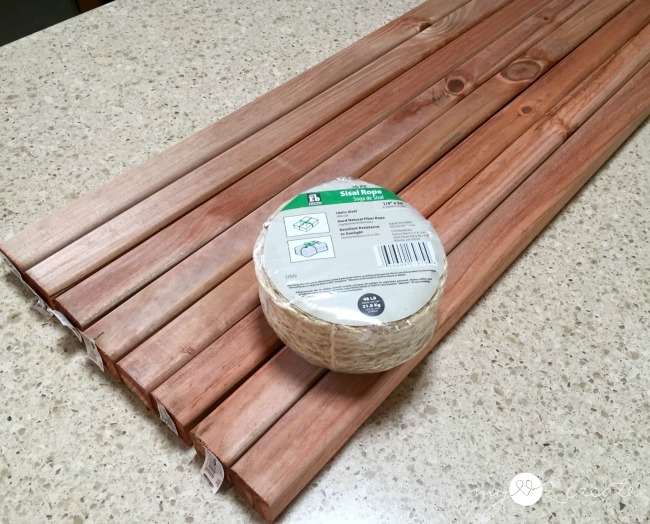 I recommend using 9 balusters or 2x2's if you want to make them 1" to 1 1/2'' in size. Circular saw, 3/8'' drill bit, Drill, scissors, tape measure, clamps, pencil, scrap wood, sand paper, safety gear. Here are my balusters and rope, time to cut! 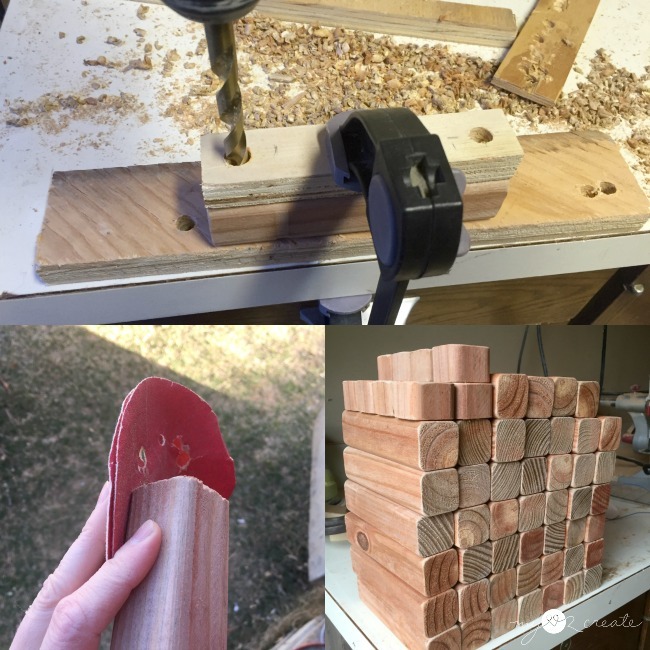 I started by cutting my small ends at about 3/4'' in order to get all of my pieces from only 8 balusters. Start by cutting a small piece from each of the 7 balusters and then on the 8th baluster, cut the last 5 pieces. Then you can start cutting the 6'' pieces from the rest of the balusters. You can see I used a piece of wood and a clamp to make a stop so I didn't have to measure each time. 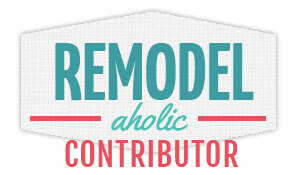 Then I drilled my holes. 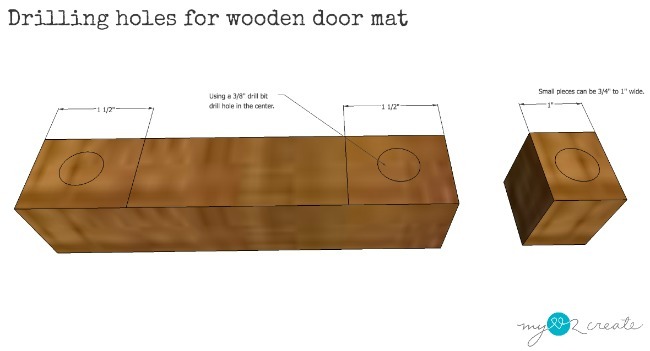 I found it easiest to make a template out of a scrap piece of plywood or a 1x2. I clamped my template to my 6 inch piece and drilled my holes. This also helped keep them straight, since I don't have a drill press. 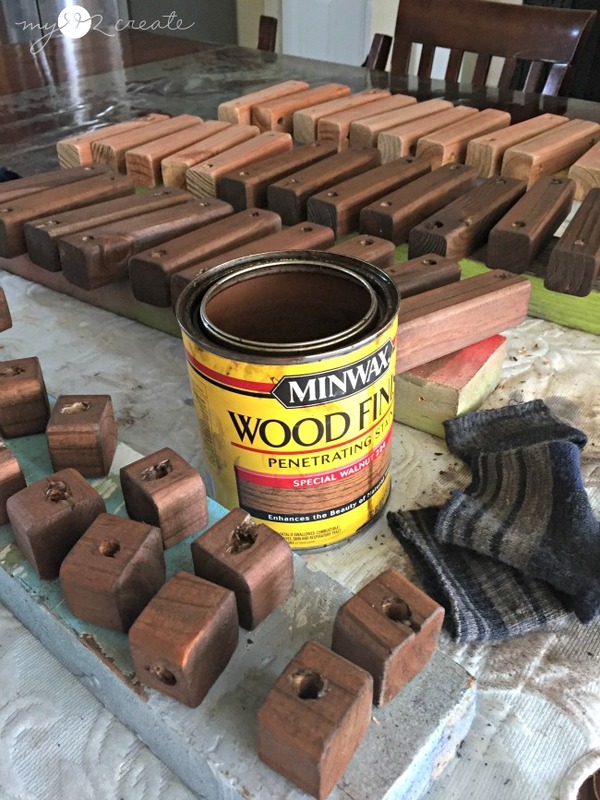 Then I quickly sanded the edges and I was ready to stain! I determined where I wanted my boards to overlap and then drilled a hole in the center of that area, here is a diagram of where I did my holes. 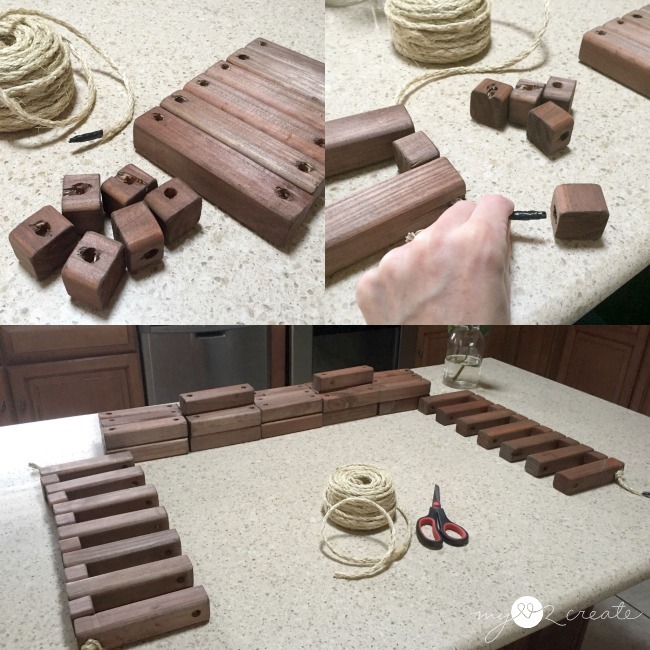 My small pieces were 3/4'' because I used the 8 balusters, but if you use 2x2's you could make them 1'' or even 1 1/2''. 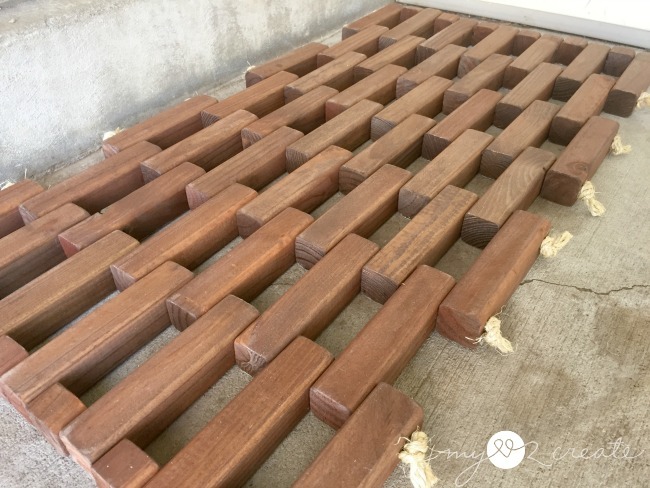 Also I want to note that because my small pieces were only 3/4'' I had to adjust where I drilled the holes on the outsides of 6'' pieces on each end. 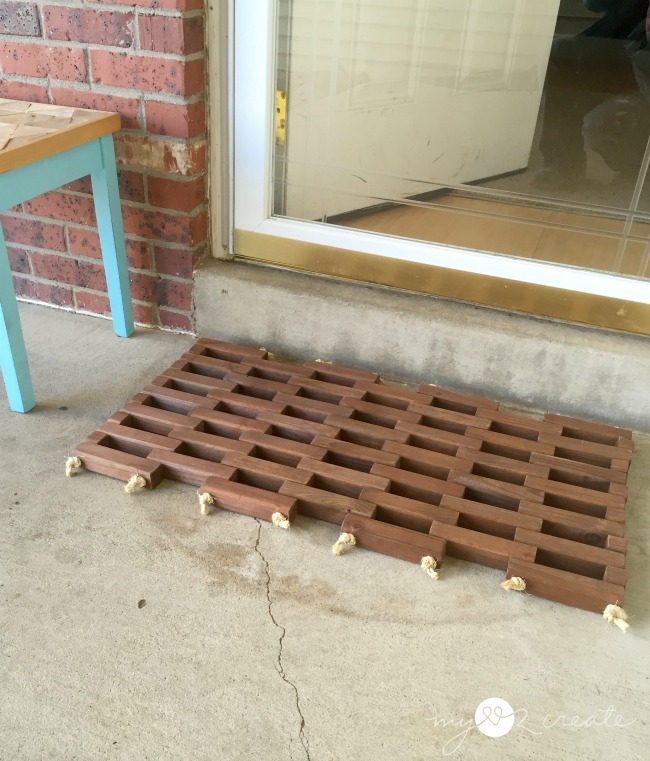 This was to make sure the holes matched up and so the ends of the mat would be even. 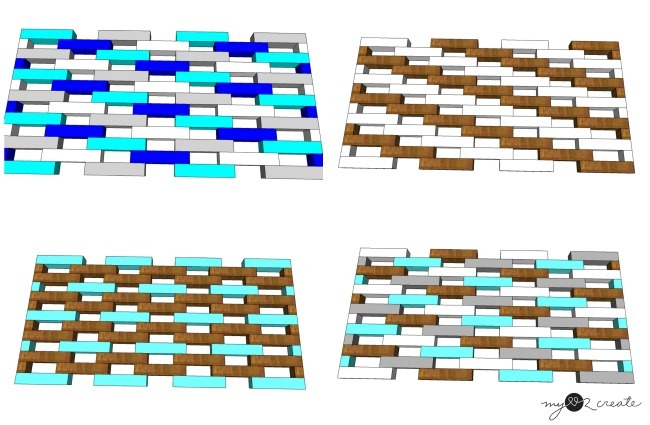 So the 7 pieces on each side of the mat, their outside holes were centered at 3/4'' instead of 1 1/2''. Hopefully that makes since. 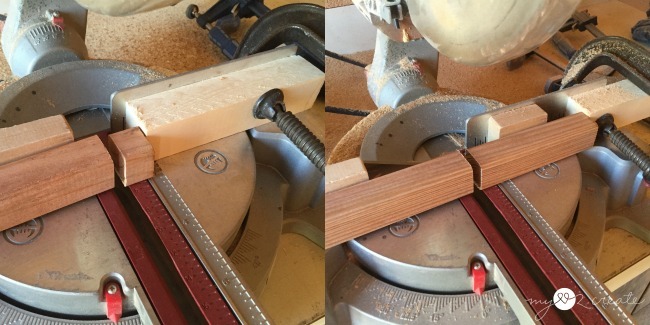 If you cut your small pieces at 1 1/2'' then you would not have to adjust your hole placement for those outside pieces. Using electrical tape on the end of my rope I started by threading the two outside rows, tying a knot in the rope at both ends. Then I just started adding one row at at time! It was really quick and easy at this point. I wanted to have a fun pattern on one side and leave it stained on the other to make it reversible. Since I am such an indecisive person this was really hard for me! Sooo many options...and colors! I tried out several to see how it would look, so I thought I would share with you some of my other ideas. I ended up with just a white chain type pattern and used a small foam brush to go over the tops of the wood that I wanted painted. 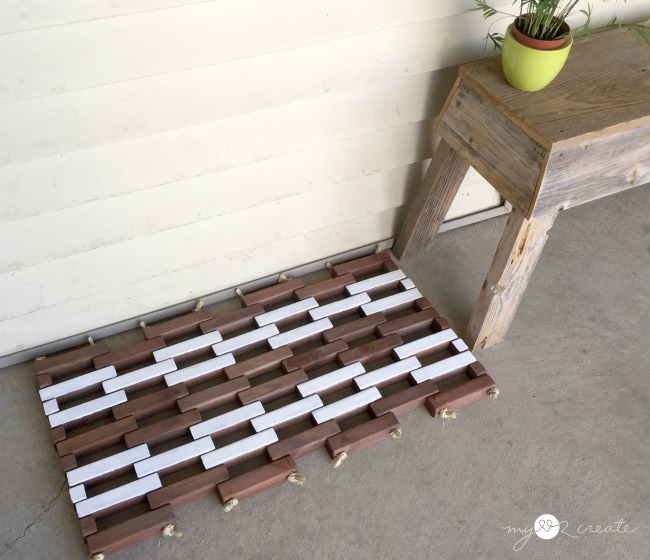 I recommend using a small piece of cardstock or paper to slide between the wood that you want painted and the wood you don't want painted, or you could tape, but that takes more time! Here is the stained side. 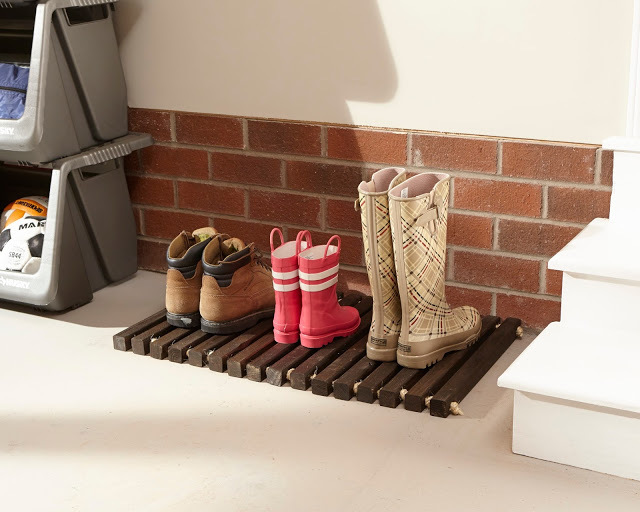 It is perfect for wet shoes or boots. Or just a spot for wiping your feet. And fun! I am so happy to finally have one! Now how about you do you want to make your own!? You can do it at your Local Home Depot this Saturday! Thanks for visiting, please come again soon! Great pattern Mindi, love the reversible concept. 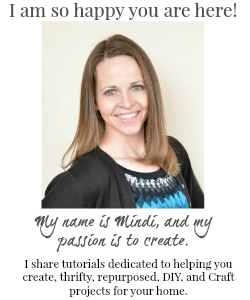 Love the geometric pattern Mindi! Love it Mindi! It turned out really cute. It looks great, Mindi! I love that it's reversible and that you gave different pattern options! I love the pattern and that it's reversible!! Very cool! 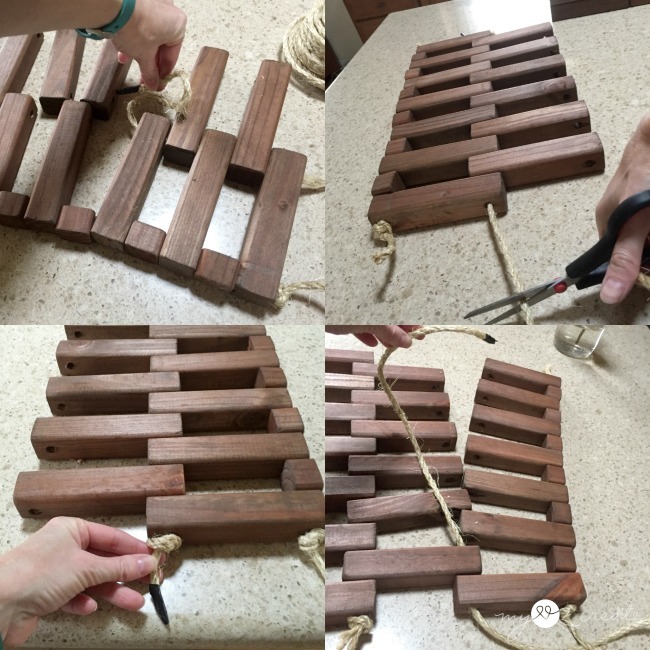 Your DIH door mat turned out so awesome Mindi! I love, love, love the white chain pattern. I can't wait to see what the others look like.... off to check them out! Love this! Ingenious to make it reversible. 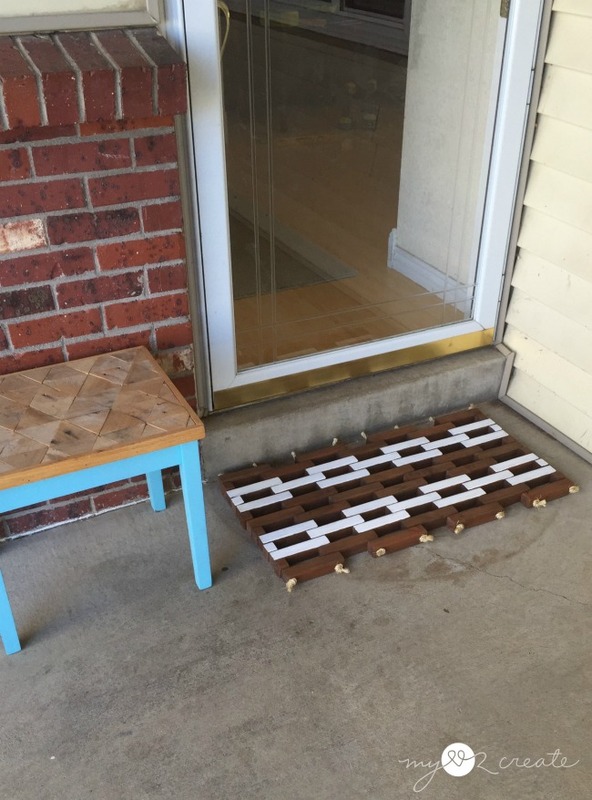 I need to up my doormat game, starting with getting one! ;) Visiting from The 36th Avenue party. Love this, Mindi! I love the chain link pattern so much! Awesome job. Great door mat!! I love the idea of having two options! 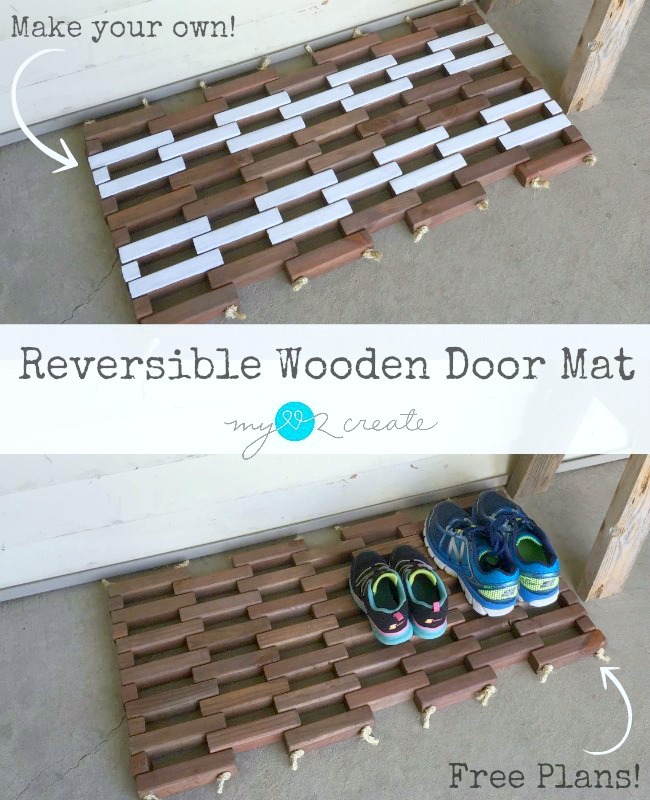 I am so impressed with you reversible doormat.